Sri VijayIndra tIrtha is one of the most prolific writers from the Dvaita School of Vedanta. He was a star pupil of Sri vyAsa tIrtha and the parama-guru of Sri Raghavendra tIrtha (Rayaru). He was also the foremost defender of dvaita in the post-Vyasa tIrtha period, especially in the southern parts of India. If there are adherents of dvaita in Tamilnadu today, then a big part of the credit should go to him. He was the one who defended it steadfastly against the combined onslaughts of powerful Advaitic, Visistadvaitic and Saiva schools. He also laid the groundwork for the advent and flourishing of Rayaru. In total, the Madhva community owes him a huge debt of gratitude for his yeoman service. In spite of this, he is not as well known to the common Madhva as he ought to be. This write-up is an attempt to correct this wrong and to put the spotlight on the remarkable service that this great ascetic has rendered the Madhva community. 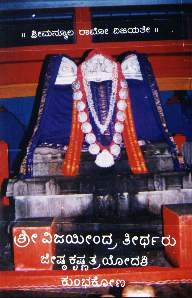 Sri padmanAbha tIrtha was one of the earliest disciples of Acharya Madhva. After the Acharya, he became the head of the lineage. He was in turn succeeded by Sri narahari tIrtha, Sri mAdhava tIrtha, Sri akshObya tIrtha, Sri jayatIrtha (also known as tIkAkrutpAdaru) and Sri vidyAdhirAja tIrtha. After him, due to factors beyond human control, the lineage split into two branches – one headed by Sri kavIndra tIrtha and another by Sri rAjendra tIrtha. The latter is also known as pUrvAdi maTha (which is more popularly known today as Sri vyAsarAya maTha). In the other line, Sri kavIndra tIrtha was succeeded by Sri vAgIsha tIrtha and Sri rAmachandra tIrtha. Once again, due to factors beyond human control, the lineage split into two branches – one headed by Sri vibhudEndra tIrtha (the lineage known today as Sri Raghavendra swAmy maTha) and another headed by Sri vidyAnidhi tIrtha (Sri uttarAdi maTha). Sri vibhudEndra tIrtha was a very well regarded scholar and saint who strove very hard to propagate the philosophy of Acharya Madhva. One of his many disciples was Sri SripAdarAjA. Sri vibhudEndra tIrtha was followed by Sri jItAmitra tIrtha, Sri raghunandana tIrtha Sri surEndra tIrtha and Sri VijayIndra tIrtha. There are two schools of thought about the period in which Sri vijayIndra tIrtha existed. The traditional school, based on the Raghavendra swAmy maTha’s internal records and outlined in guru-charitre by Dr. H.K. VedavyAsAchArya puts this as 1575 – 1614. The other school, lead by Dr. B.N.K Sharma, puts this as 1514 – 1595. Each group has its own rationale for its claim. There is no unanimity about the circumstances under which he came under the care of Sri VyAsa tIrtha. One version says that he was Sri VyAsa tIrtha’s nephew or some other close relative. Another says that Sri VyAsa tIrtha blessed a poor, childless couple to have 2 sons with the provision that the first born would be given to him, and that is how he got the baby. In any case, everybody agrees that the boy was named as Sri Vittalacharya and Sri VyAsa tIrtha personally oversaw the upbringing and education of the child. He had mentally resolved to make the boy his successor and so ensured that he had all the necessary pre-requisites. At a suitable time, the boy was initiated into sanyAsa with the name Sri vishnu tIrtha. Sri VyAsa tIrtha personally taught the 64 arts to him and was waiting for a suitable time to hand over the reins of the maTha to him, but the Lord had other plans! Sri surEndra tIrtha was the pontiff of the Sri Kaveendra Teertha Parampara at that time. He was aged and looking for a good successor. By divine will he happened to pass by Vijayanagar and decided to visit Sri VyAsa tIrtha. Sri VyAsa tIrtha received him with all due honors and respect and pressed him to stay in Vijayanagar for a while. One dvAdashi day before pAraNe, Sri surEndra tIrtha refused to continue with the pAraNe unless Sri VyAsa tIrtha granted him a wish. Sri VyAsa tIrtha replied that he could ask for anything except his beloved shishya, Sri vishnu tIrtha. Sri surEndra tIrtha replied that that was precisely what he had intended to ask and that he did not desire anything else. Sri VyAsa tIrtha was heart-broken for a few moments. He then contemplated on the Lord for a few seconds and realized that this was what the Lord wanted. He immediately set aside his grief and agreed to Sri surEndra tIrtha’s request. This incident shows the greatness of Sri VyAsa tIrtha and illustrates how a true bhAgavata bows before divine will and sacrifices his personal desires and preferences. Sri surEndra tIrtha was overjoyed to receive Sri vishnu tIrtha as his successor and renamed him Sri VijayIndra tIrtha. Sri vyAsa tIrtha spent some time with Sri VijayIndra tIrtha, giving him his blessings and very valuable parting advice, before sending him off with Sri surEndra tIrtha. Sri VijayIndra tIrtha visited Kumbhakona as directed by his guru. Kumbhakona was then a part of the province of Tanjore, under the Vijayanagar empire. A Veerashaiva ascetic called Yemme Basava had the town under his thumb and was harassing all VaishNavas. Hence Sri VijayIndra tIrtha’s entry into the town was welcomed by them. In due course, a vAkyArtha (debate) was held between Sri VijayIndra tIrtha and the shaiva ascetic. The shaiva ascetic was a very strong pundit, with knowledge of shruti and smruti. He used the entire depth of his knowledge to prove his point and defeat Sri VijayIndra tIrtha, but nothing prevailed in front of the ocean of erudition called Sri VijayIndra tIrtha. The debate lasted for 11 days after which the shaiva ascetic accepted defeat. According to the terms of the debate he was supposed to embrace dvaita and become a disciple of Sri VijayIndra tIrtha, but unwilling to do this, he fled the scene overnight. The shaiva maTha and all its possessions became the property of Sri VijayIndra tIrtha. By achieving this victory, Sri VijayIndra tIrtha created a bastion for dvaita in Tamilnadu and became the inspiration for other mAdhva ascetics in the southern part of the country. News of Sri VijayIndra tIrtha’s victory in Kumbhakona spread far and wide. RAma rAya the ruler of Vijayanagar sent a message to Sri VijayIndra tIrtha inviting him to Vijayanagar. Sri VijayIndra tIrtha gladly accepted because he wanted to visit the BrindAvana of his guru Sri VyAsa tIrtha. Accordingly, Sri VijayIndra tIrtha proceeded to Vijayanagar where he was received with royal honors. Excellent arrangements were made for the stay of Sri VijayIndra tIrtha, under the personal supervision of the king. In due course of time, the king invited Sri VijayIndra tIrtha to the royal court and showed his reverence by performing Ratnabhisheka. Sri VijayIndra tIrtha was made to sit on a specially consecrated seat of gold and showered with precious stones. All the scholars and chieftains in the court watched this glorious event with reverence. Everybody prostrated before Sri VijayIndra tIrtha with utmost devotion. Sri VijayIndra tIrtha submitted their adoration and prostrations to Lord Moola Rama and blessed them. Sri VijayIndra tIrtha visited Sri vyAsa tIrtha’s brindavana in Anegondi and spent some time there in honor of his guru. He returned back to Vijayanagar and spent some time there. Being a great ascetic he foresaw the fall of the empire and warned the king about it. He gave the king a lot of valuable advice. Finally, after some time, he embarked on a tour of India. He traveled a lot, spreading the teachings of Acharya Madhva and debating with opponents. He returned to KumbhakoNa after establishing the supremacy of dvaita over all other doctrines. Sri Appayya Dikshita was an extraordinary scholar with profound mastery over shruti and smruti. He had been profusely honored by the ruler of Tanjore and was considered an AsthAna pandit (Scholar of the king’s court). He was propagating the doctrine of Shaiva-advaita, which added the concept of Shiva sarvottamatva to advaita. Sri VijayIndra tIrtha invited him to the maTha and discussed several doctrinal issues. This was the beginning of a long and cordial interaction between Sri VijayIndra tIrtha and Sri Appayya Dikshita. Sri Appayya Dikshita tried his level best in hundreds of ways to put down dvaita and make Sri VijayIndra tIrtha accept defeat. But Sri VijayIndra tIrtha answered every one of his attacks with successful counter attacks and made Sri Appayya Dikshita accept defeat every single time. In spite of the lively discussions and debates, the atmosphere remained very cordial and scholarly in nature. One such incident is outlined below as an illustration. It is very well known and established that every word in every language connotes Sri Hari (called sarva-shabda vAchatva in shAstra). Appayya Dikshita tried to establish this with Shiva also, but Sri VijayIndra tIrtha proved that this was not possible, using the word ‘Narayana’ as an example. Inspired by this event, Sri VijayIndra tIrtha immediately composed a beautiful work called “NarayanashabdhArtha nirvachanam” outlining more than a hundred meaning for the word ‘Narayana’. Incidentally, Appayya Dikshita is the vile creature who cast a lot of aspersions on Acharya Madhva, accusing him of quoting imaginary or non-existent references. One shudders to think of the havoc that he would have caused if a great savant like VijayIndra tIrth had not been there to counter him and defeat him at every turn. It was very widely known that Sri VijayIndra tIrtha had learnt the 64 arts from Sri vyAsa tIrtha and mastered them. This fact acted as a magnet to people from different walks of life like painters, sculptors, musicians, dancers, weavers, potters, and so on. Some came to show their expertise to Sri VijayIndra tIrtha and earn his blessings and patronage. Others came to challenge him in their respective arts and prove their superiority. No matter what the original intention was, people always returned with awe and wonder in their heart after personally witnessing his mastery over their specific area of expertise. The reference book “Ajaya VijayIndraru” provides many illustrations of such contests. The ShoDasha bAhu narasimha icon a very unique and magnificent icon of Lord Narasimha, that was discovered by Sri Vibhudendra tIrtha in Ahobila. It is an awe-inspiring icon of the Lord with different weapons in fourteen hands. In the other two hands He is ripping open the stomach and pulling out the intestine of the demon HiraNyakashipu lying on His thigh. The abject terror on HiraNyakashipu’s face contrasts with the intensity of fury on Narasimha’s face. Like other ascetics in the Raghavendra matha Sri VijayIndra tIrtha too had the privilege of worshipping this icon in person. Once, some vile magician tried to harm Sri VijayIndra tIrtha, him by poisoning the naivedya offered to Sri Mula rAma devaru. How can poison affect the Lord who is responsible for the creation, sustenance, maintenance and destruction of this entire universe? How could it affect such a great devotee like Sri VijayIndra tIrtha? Obviously not, but Sri VijayIndra tIrtha saw this as an opportunity to demonstrate to the world the power and potency of the Narasimha mantra. Accordingly, he composed a unique stotra to Lord Narasimha consisting of several bIjAksharas (primordial syllables) and offered that with devotion to the Lord. The nectar that issued out from his devotion-soaked lips is the Sri ShoDashabAhu nrusimhAsTaka. Any eligible person who chants this mantra daily with devotion and a clean and chaste body and mind will be free from the effects of all poisons, and in addition, will attain all his desires. This icon is worshipped in the Raghavendra maTha even to this day. Sri Vijayindra tIrtha is said to have written 104 works, of which very few are available. The Raghavendra Vijaya stipulates that only one who has studied the works of Sri Vijayindra tIrtha can be considered a great scholar! The guru-guNa stavana by Sri VadIndra tIrtha says that the tree of dvaita vedanta flowered under Sri Vijayindra tIrtha (“puShpitoyamjayIndrA dadya”). Incidentally, the Raghavendra stotra says that Rayaru used Sri Vijayindra tIrtha’s work called Vaag Vaikhari to defeat a formidable opponent called Sesha (“Vaag Vaikhari nirjita bhavya sEshah”). Rayaru makes deferential references to the works of Sri VijayIndra tIrtha in his own works. Sri VijayIndra tIrtha was well-versed in several branches of learning such as Kavya (Poetry), Nataka (Drama) and Rhetorics. He has several dramas to his credit, a rarity for a mAdhva ascetic. ¨ Nyayamauktikamala – Gloss on Chandrika criticizes the views embodied in the Sankara Bhasya and Srikantha Bhasya. ¨ Vagvaikhari : A short tact dealing with validity of Vedas and scope and purpose of Bhedhashrutis. ¨ Bheda vidya vilasa : It is devoted to the establishment of the reality of difference in it’s five fold aspect. It is direct criticism of Bhedadhikkara of Nrshimasharma. ¨ Parattva prakAshika : A criticism of Sivattva-Viveka of Appayya Diksita, who seeks Shiva as the supreme Brahman of Veda. ¨ Madhvadhva-Kantakoddhara : A reply to the critics made by Appayya Diksita in his Madhvatantra –Mukhabhanga; against Madhva’s cogency and adhikaranas. ¨ Chakra-Mimamsa : A tract in which Sri VijayIndra establishes shastric character of practice of branding the body with Vaishnava symbols; on the basis of Vedic text. ¨ adhikaraNa mAla – Work explaining Mimamsa rules of interpretation utilized in Nyayamruta. ¨ Shaiva sarvasva khandanam : A short tract discussing eleven Puranic legends touching supremacy of Shiva over Vishnu. ¨ Appayya-Kopola-Chapetika : A rejoinder to the multifarious charges against Madhva and his works , made by Appayya Diksita. ¨ brahmasUtra Nyayasangraha : A short metrical tract offering the gist of Adhikaranas of Brahma Sutras of Srimad Acharya. ¨ Kuchodyakuthara : A tract dealing with the Sutra interpretation and defending the particular arrangement adopted by Sri Madhva. ¨ ubhayagrasta rAhUdaya : A Sanskrit drama. ¨ Madhvantara-Nyamanjari : It is a short argumentative work the Sutra-Prasthana. The adhikarana-sariras of rival Bhamati and Vivarana are criticized. Sri Surendra tIrtha, the guru of Sri VijayIndra tIrtha, had prompted him to grant sanyAsa to Sri SudhIndra tIrtha. Sri VijayIndra tIrtha personally supervised the education of Sri SudhIndra tIrtha and chose him as his successor. After handing over the reigns of the maTha to his successor, Sri VijayIndra tIrtha entered his brindavana in Kumbhakonam (Tamilnadu) on Jyeshta Krishna Trayodashi. 1. History of the dvaita school of Vedanta and its literature – Dr. B.N.K Sharma, Motilal Banarsidass, Delhi, 1981. 2. Ajaya VijayIndraru – Kannada book by Sri Raja GururajAchArya. 3. Guru Charitre – Kannada book by Dr. H K VedavyAsAchArya.